As cosy as sleeping bags are, nowadays they're designed so that you often feel like you're being buried alive. Lovely to be so warm, not so lovely to feel quite so incapacitated. 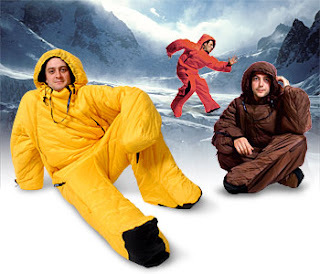 Introducing the most revolutionary, and definitely the coolest (though very warm of course) sleeping bag ever invented. The SELK is the sleeping bag you wear, so if it's still freezing outside (or inside if the heating's packed in) when you get up, you don't need to get out of your sleeping bag! You can walk around quite happily in temperatures as ludicrously low as -8.4 degrees C! It has an integral hood, and you can unzip the ends of your arms to get your mitts out to spark up the primus on Everest - or pop some bread in the toaster if your flat's dropped below a civilized temperature. The suit lining is made from soft-touch nylon, is padded with a Polyester Hollow Fibre Bonded filling, and comes in four colours and two sizes, small-medium, and large - extra-large. The SELK makes winter something to look forward to, and of course, it's the ultimate answer in how to be cool when you're warm.